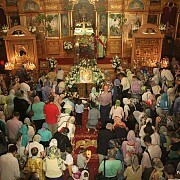 On Sunday May 31, the great feast of Holy Pentecost, the Administrator of the Patriarchal Parishes in the USA celebrated the festal All-night Vigil and Divine Liturgy in St. Nicholas Cathedral in NYC. On Wednesday May 27, the Administrator of the Patriarhcal Parishes in the USA, His Grace Bishop John of Naro-Fominsk attended a reception at the Consulate General of the Russian Federation culminating in the celebrations in honor of Russian-American History Month in New York State. 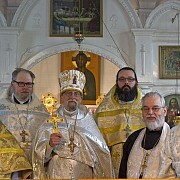 On Sunday, May 24, the Administrator of the Patriarchal Parishes in the USA, His Grace Bishop John of Naro-Fominsk, celebrated the Sunday Divine Liturgy in St. Nicholas Cathedral in NYC. 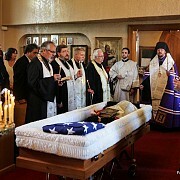 On Monday May 18, the Administrator of the Patriarchal Parishes of the US, His Grace Bishop John of Naro-Fominsk served the final Panihida for the newly-departed Archimandrite Illya (Barna) who reposed on May 8th. 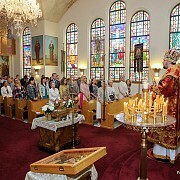 On the Sixth Sunday after Pascha, May 17, the Administrator of the Patriarchal Parishes in the USA, His Grace Bishop John of Naro-Fominsk celebrated the Divine Liturgy in St John the Baptist Church in Little Falls NJ on the occasion of the 100th Anniversary of the parishes' founding. On the 5th and 6th May the clergy of the Central States Deanery of the Patriarchal Parishes in the USA assembled for the first of their two semi-annual meetings of the Deanery at the parish of Saint John Chrysostom Church in Grand Rapids, Michigan. On Friday May 8th, the eve of the 70th Anniversary of the Allied victory in World War II, a Panihida was led in St. Nicholas Cathedral to commemorate all the soldiers who perished on the battlefield. 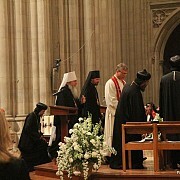 On Thursday, May 7, an official ceremony marking the the 100th Anniversary of the Armenian Genocide was held in the Washington National Cathedral. 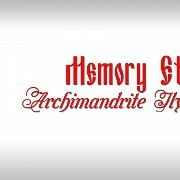 UPDATED 5/12 - Early in the morning on May 8, the senior-most cleric of the Patriarchal Parishes in the USA and Pastor-Emeritus of St. Michael the Archangel Church in Redford, MI, Archimandrite Illya (Barna), reposed in the Lord. 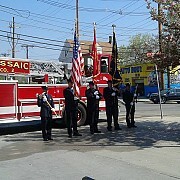 On Friday, May 8, 2015 Priest Stephen Kaznica was invited by Passaic NJ's Fire Chief, Patrick Trentacost Sr. to participate in the annual memorial service for the fallen city firefighters. 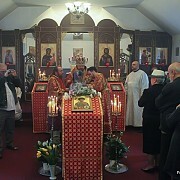 On Wednesday May 6th, the feastday of the Holy Great Martyr and Trophy-bearer George, the Administrator of the Patriarchal Parishes in the USA, His Grace Bishop John of Naro-Fominsk, celebrated the Divine Liturgy in St. George Church in Bayside, NY on the occasion of its patronal feastday. 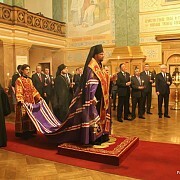 On Tuesday, May 4th, the Administrator of the Patriarchal Parishes in the USA, His Grace Bishop John of Naro-Fominsk, attended an official reception in honor of the 70th Anniversary of Allied victory in World War II.